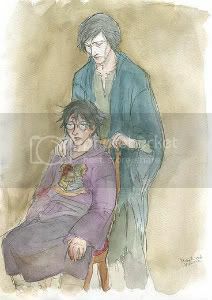 Dumbledore leads Harry back to his own office, where Sirius is waiting, and Harry recounts what happened again. We finally get an explanation about the connection between the wands. Harry blissfully drifts off in the hospital wing under the watchful eyes of Molly and his friends, until he's awoken by McGonagall yelling at the Minister, Cornelius Fudge. Here's a hint, Corny: if you want evidence and a trial, don't take a Dementor with you to the interrogation. Now even Snape showing him his Dark Mark won't convince Fudge that Lord Voldemort is back. 1) Why, why, WHY did Fudge bring the Dementor in to question Crouch Jr.? 2) Everyone seems to trust Dumbledore (except Fudge, of course, who's just a git) - Snape, Sirius, Molly, McGonagall - why do they trust him so much? 3) What do you think about Harry's relationship with Molly? Is she a mother to him? I think it is for Fudge's stated reason, that he felt the need for protection. However, he could perhaps have heard Harry say to Dumbledore that Voldemort was back so it is possible he was already preparing to deny Dumbledore' s claim that Voldemort was back, though I think it unlikely. All those you list (except Fudge) were in the Order or closely related to Order members during Voldemort's first rise, so they would know from experience that Dumbledore was trustworthy. Also if you wish to fight Voldemort, then following Dumbledore, who has already defeated a dark wizard, seems a good choice, particularly as the Ministry is refusing to accept Voldemort is back and didn't do very well at opposing him last time. I think Molly tries, but Harry has had to learn to look after himself so it is too late for him to accept Molly as his mother. I think in this moment - after all that Harry had been through that night and realizing that Fudge wasn't believing what he had eye witnessed - Harry was the most vulnerable that we have ever seen him. He had been traumatized repeatedly by all that had happened. When Molly hugged him, he gave into her motherly protection. But it didn't last long. I think the very sad thing about this was that Harry couldn't remember being hugged like this - by a mother. That just smacks in the face of what a poor substitute Petunia was for mother. It also gives us some idea why Dudley was as nasty as he was. If Harry was treated without hugs and comfort during his childhood, Surely Dudders got very little too. That's not to say Petunia didn't treat him better than Harry, but Duddikins witnessed the poor mothering of Harry and I am sure he wondered when that anger and hurt would be turned on him. It is no wonder that Harry felt a strong attachment to Molly at that point, however I don't feel that Harry felt she was a 'mother' to him. He had known his own mother's love. He had visited her in the Mirror of Erised. He had heard her dying voice trying to protect him. Harry had an allegiance to his own mother that Molly could not break. Yes, Molly tried to 'mother' him and at this very low point for Harry, he accepted that mothering briefly. I think Harry will always be extremely fond of Molly, but I do not think he could have elevated her to the status of being his mother. Don't know if anyone will see this, but.....I'm an OLD Leaky member and member (who has not been very active) here. I am re-reading all the books once again. Tired of watching the movies run to death on Freeform!! The answer (as I interpret it anyway) is Chapter 35 of Deathly Hallows. ‘He took my blood,’ said Harry. I think that Dumbledore knows or guesses this as soon as Harry tells him about what happened in the graveyard. Hi Lillian, Hey Roonwit! Was this also the reason that Harry was not done for, but was able to return after Voldemort AK'd Harry in the forest 'at the close'? All Voldemort was able to kill was the bit of horcrux that Harry was carrying inside. That does seem to be the predominant theory. By both of them having Lillian's protection when Voldy Ak's Harry - The protection does kill that Horcrux of Voldy's in Harry's scar but doesn't kill Harry. Also by Harry allowing Voldy to 'kill' him, i.e. he is sacrificing himself for the people in the castle and then his 'love' protection then save others from Vody's wrath and ability to kill them.